There's a time and a place for egg yolks (hello, avocado hollandaise). But on a Tuesday morning before hitting the gym, you want a quick, protein-filled breakfast that won't weigh you down. Ta-da: These 10 clean-eating egg-white recipes are right up your alley. 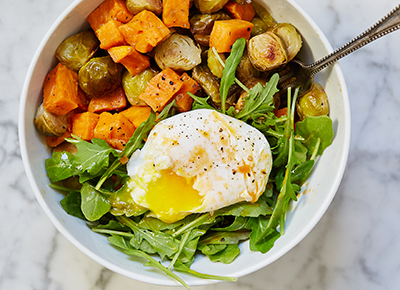 Coterie member Heidi Larsen gives us a super-healthy breakfast whipped up in less than 15 minutes. Eat your heart out, Starbucks. You’ll thank us later when you have these stocked in the freezer and can always skip the line. It's not just for pasta anymore. Pesto-laced eggs are about to be your new favorite. Making muffins a bit more virtuous, thanks to skim milk, egg whites and brown sugar. And you thought this Southern classic was gluttonous? This variation is Paleo, gluten-free and Whole-30-friendly. Combine strawberries, elderflower liqueur, lime whipped cream, confectioner's sugar and egg whites and the world's classiest brunch is served. This gluten-free breakfast is ready in just ten minutes. Sayonara, Frosted Flakes. Coterie member Jodi Moreno brings us a killer homemade breakfast cereal.